Browse the web free from clutter! 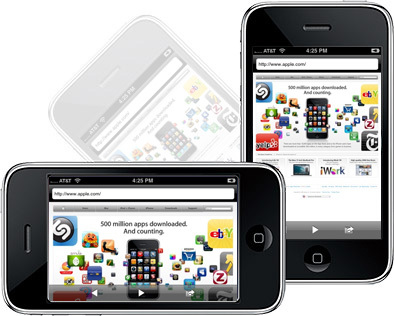 The Full Screen Web Browser from SOPODS is a true full-screen web browser available for the iPhone and iPod Touch. This app gives you up to 40% of your screen's real estate back by hiding the buttons, address and even the status bar when you don't need them. Now you can take full advantage of the ample screen on your iPhone or iPod Touch. "Full Screen Web Browser is a great Safari companion for its cheap 99¢ price." Already have Full Screen on your iPhone? Make sure to install the Full Screen bookmark. How does it work? Simple! Give your iPhone or iPod Touch a shake to bring the buttons and address bar into view, then enter a URL and the control bars will slide out of view for a true full-screen experience. Surf the web exactly like you do in Safari: tap on links, swipe to scroll, double-tap or even pinch and spread your fingers to zoom in or out. Almost 40% more viewable area than Safari in landscape mode! Same web browsing experience as Safari on the iPhone: tap links, scrolling, zooming, etc. Have questions about using Full Screen Web Browser? Check out our help page. Horizontal mode is fully supported. Rotate your device right or left for larger and easier to read text and larger images. The address and button bars are also available when your device is rotated-just give it a shake! Full Screen does not save any history of your activity on the web between sessions. Recent activity is only used for the "back" and "forward" actions. Simply tap the home button and your browsing history is gone. Send any web page to Safari whenever you like by tapping the action button and then "Open in Safari"
Send any web page back to Full Screen from Safari using our custom bookmark. Have Full Screen load your favorite page when it first launches. Your homepage can be easily set by tapping the action button and then the "Set as Home Page" button while you are on the page. The homepage address can also be set in the iPhone Settings app. Email anyone a link to a web page by tapping the action button and then "Email Link". By popular demand, BOOKMARKS have been added to this release! Initial release, redefining mobile web browsing. It's simple really. We produce killer iPhone applications. The iPhone is an incredible new computing platform that offers features and flexibility never before available. Our mission is to make the most of this new platform with applications so rich you'll have a hard time believing you're on a mobile phone. Keep your eyes peeled. More apps will be launched very soon. Full Screen Web Browser v1.0 is live on iTunes app store. iWoopi v1.0 is live on iTunes app store. WeeJee Board v1.2 is live on iTunes app store. Poker Odds v2.0 is live on iTunes app store. Relax v2.0 is live on iTunes app store. Relax v1.1 is live on iTunes app store. WeeJee Board v1.0 is live on iTunes app store. © 2019 SOPODS.com. All Rights Reserved. iPhone, iPhone 3G, iTunes, App Store, iPod, and iPod Touch are registered trademarks of Apple Inc. Copyright © 2019 Apple Inc.